Screen Time is a feature in iOS 12 devices which provide information about how you have been using your phone. This helps the users to effectively manage their time. Screen Time can be used to put restrictions on the device's applications remotely from the iPhone's settings through iCloud. For eg, this can be used by parents who want to restrict their children's usage of iOS devices by adding app limits. 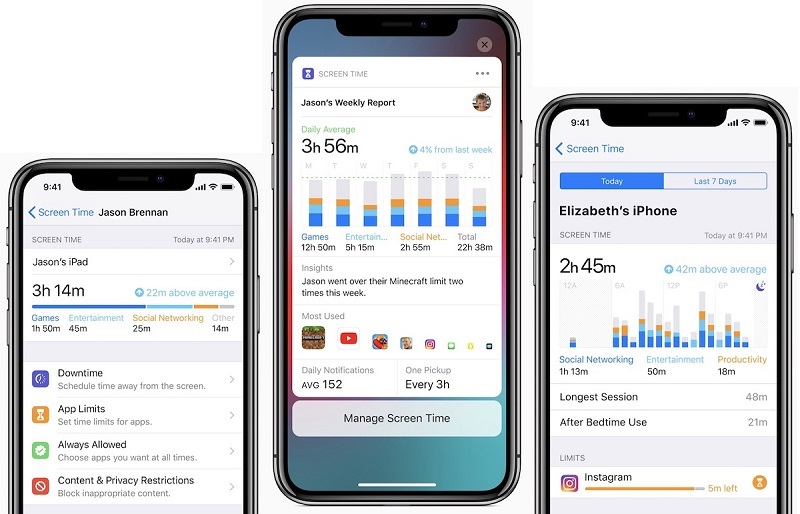 There are many times when you experience the screen time not working on your device, this article elaborates the iOS 12/12.1 Screen Time bug fixes for the most common iOS 12 Screen Time issues. Screen Time can be accessed on all iOS devices by going to "Settings" and then clicking on "Screen Time". But in the latest iOS 12 devices, you may find that when you click on "Screen Time", you will notice iOS 12 Screen Time error of the Screen Time not being accessible at all. 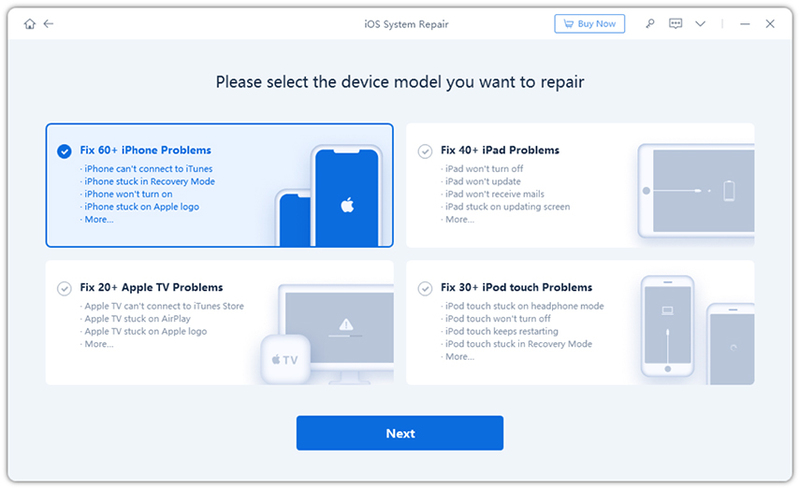 If your iOS 12 Screen Time crashes, it can be fixed by either force restarting your iOS device or by repairing the iOS system completely. iPhone 6/5/iPad: Press and hold both Power button and Home button together. Don't release until you see the Apple logo screen. iPhone 7/7 Plus: On the right side or on the top of your device you can locate the Power Button. Press that and hold. On the left side of your phone you can locate the Volume Down Button. Simultaneously press this and hold till Apple ogo appears. iPhone XS/XS Max/XR/X/8/8 Plus: Press the Volume Up key and release, then press the Volume Down key and release. Together press the Side key and hold it until the screen shows the Apple logo. Your phone gets rebooted and now you can try accessing Screen Time. There is a very simple fix for the problem of iOS 12 Screen Time not updating. You can follow the guidelines below to solve this issue. Step 1: From the list under "Settings", click on "Screen Time". Step 2: Hit "Turn Off Screen Time". Step 3: Follow the step 1 and hit "Turn On Screen Time". Your iOS 12 device will then show the updated information in Screen Time. If you have turned on Screen Time on your device, but still have the issue of iOS 12 Screen Time not reporting, follow the below steps and fix this issue. Step 1: Go to phone Settings. Step 2: Open "Screen Time". Step 3: If your Screen Time is turned off, turn it on. Step 5: Scroll down in Screen Time section and tap on "Clear Usage Data". You will be prompted to enter your Screen Time passcode to confirm. This would fix the issue and you can start recording again in Screen Time. If you are facing the problem of not being able to access many options on your device except the "Content", Privacy Restrictions" in Screen Time, because of iOS 12 Screen Time greyed out error, worry no more! The solution to this problem is very simple. Basically, if you have an iCloud family account and someone else other than you is listed as the parent or guardian, and you choose to stop sharing information on the family iCloud account, you will face this issue of options graying out. You can simply contact the person who is listed as parent or guardian in your iCloud family account and ask him/her to give you permission for access or make you the parent or guardian in the iCloud family account. As soon as they do this, you can access all Screen Time options without any issues of them greying out. If Screen Time won't open on your iOS 12 device, hindering you in accessing it, try applying the following steps to open Screen Time and gain access to its options. Force restart your iOS 12 device by following the steps of "Way 1" in "Problem 1" of this article. Step 1: From "Settings" open "Screen Time". Step 2: Disable and Enable Screen Time again. This should fix the issues of screen time not opening. If your iOS 12 Screen Time does not work because you have lost or forgotten the Screen Time password, the only option you have is to reset all settings of your phone. You will have to do it in the following way. You can deleting screen time passcode by erasing everything and setting up your device as new. You cannot use your old backups because your backups will include your passcode too. If you want to reset Screen Time passcode without data loss, you can try 4uKey - iPhone Backup Unlocker. Step 1: Go to "Settings" under "General". Step 3: Select the option "Reset All Settings" and "Erase All Contents and Settings"
4uKey - iPhone Backup Unlocker gives you the easiest way to remove Screen Time passcode directly without erasing your device, no data loss at all. Step 1: Run this software on your computer after installing and connect your iOS device to that computer. From the main interface, select "Remove Screen Time Passcode". Step 2: Next, click the Start button to start removing the Screen Time passcode. Step 3: After that, the Screen Time passcode should be removed successfully. In a scenario wherein, even after closing Screen Time on your iOS 12 device, the Sand Timer won't go, this is what you should do. Step 1: From Settings, choose the option "Screen Time". Step 2: Tap on "App Limits" to continue. Step 3: Choose the applications for which you want to delete the limit and click on "Delete Limit". Your problem should be fixed! No matter what kind of Screen Time problem you are encountering, you can fix it through a system recovery. One of the best iOS system recovery software is Tenorshare ReiBoot. This tool is aimed to fix 50+ types of iOS sutck/errors including Screen Time not working, no data loss at all. Step 1: After downloading and installing this software on your PC/Mac, on the main interface of this tool, connect your device to PC and once it is detected, click on "Repair Operating System" or "Fix All Stuck Issues". Step 2: After click "Fix Now", you can download the Firmware package online. Step 3: After the download of Firmware package, Tenorshare ReiBoot will start repairing your iOS 12 device. You can even use the Deep Repair option, but this would erase all the data on your device. This is the most convenient way of solving the problem of iOS 12 Screen Time not working. With the introduction of iOS 12 software update, many issues related to Screen Time have been encountered. These are some of the common issues faced when iOS 12/12.1 Screen Time does not work. By using the above-mentioned hassle-free ways, the most common problems of Screen Time on iOS 12 not working can be efficiently fixed. If you have Screen Time passcode problems, 4uKey - iPhone Backup Unlocker can easily solve you problem. If your Screen Time not working due to system reasons, iOS system repair software -Tenorshare ReiBoot will be perfect to you.